I think I look after the skin on my face pretty well, yet I neglect the skin on my body so much!! I exfoliate it occasionally and every now and then I'll slather on some body lotion but I've never been one of these women that do it religiously. I want to get out of the shower, dry and go. I'm definitely worse in the winter. During the cold winter months I pack away my hairy legs (and hairy everything else) and I just forget to slap on the lotion. You're the same? Thing is, the winter months play havoc with our skin don't they, what with the central heating and a million layers of clothing so I guess our body needs the nourishment more. Mine most definitely DOES. 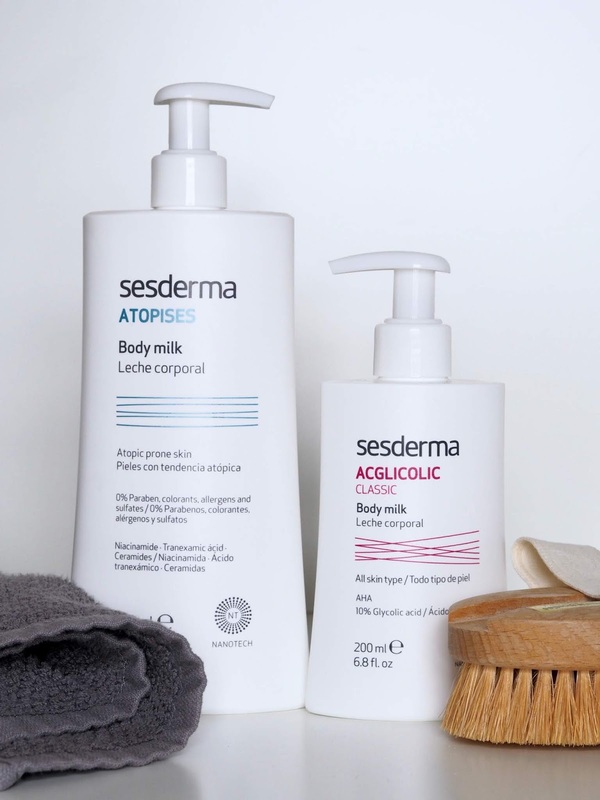 We've already had a little taster of sunshine here in the UK, although it disappeared again quite quickly, but spring really is around the corner, and time to be getting out said hairy legs and then the rest of the body as summer rolls around, so cue some totally fabulous body milks* from Sesderma. 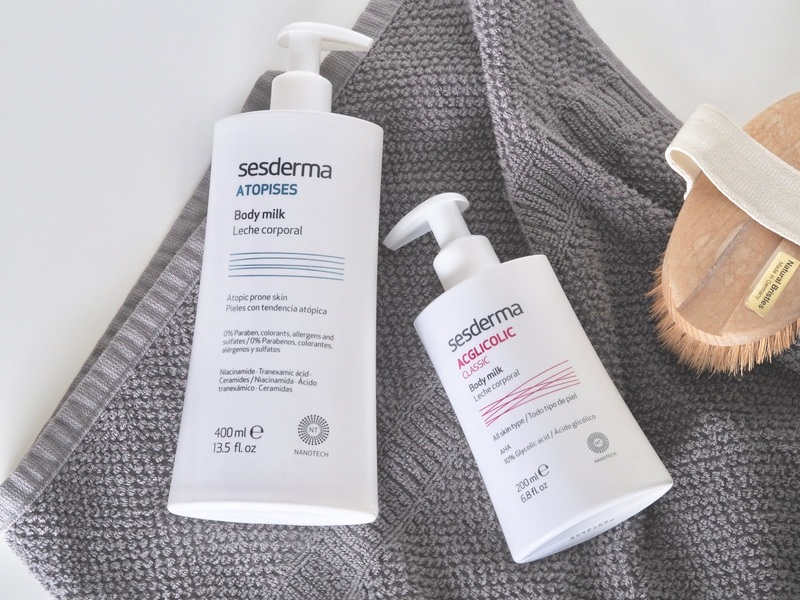 Sesderma, a big name in dermatology, were established in Spain many years ago, and is now sold all around the world. They have been looking after the needs of our skin for many years but, I cannot lie, I've only recently become more aware of the brand through upping my anti-aging skincare game. I'm part of a few skincare chat groups and I see people talk about their products on the regular now so when I was asked if I'd like to try these I was genuinely excited. 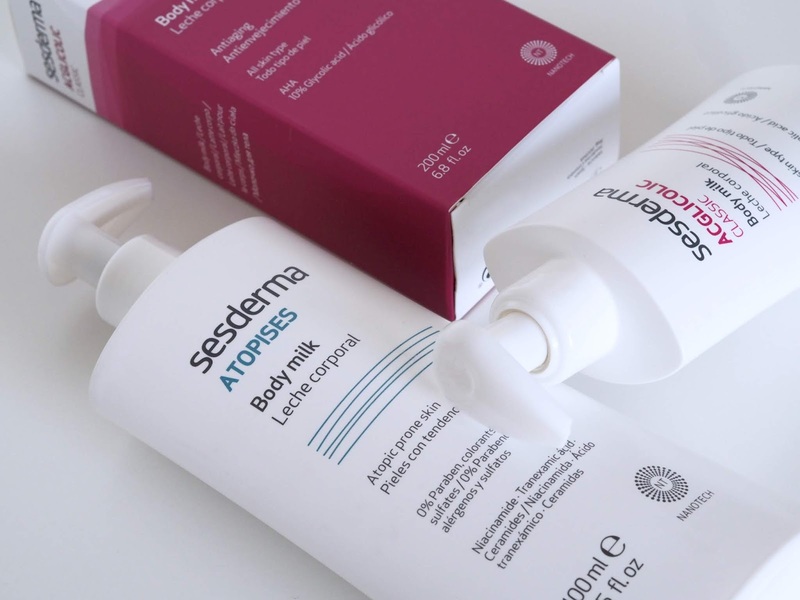 The Atopises body milk is for atopic prone skin, which is skin prone to dermatitis/eczema, but also for anyone with extremely dry skin, that'll be me then! It's a daily lotion which helps to calm and relive problematic and dry skin, keeping it protected and moisturised, preventing skin dryness and restoring the hydro-lipid barrier. It has some incredible ingredients and you can read more about them on their website. 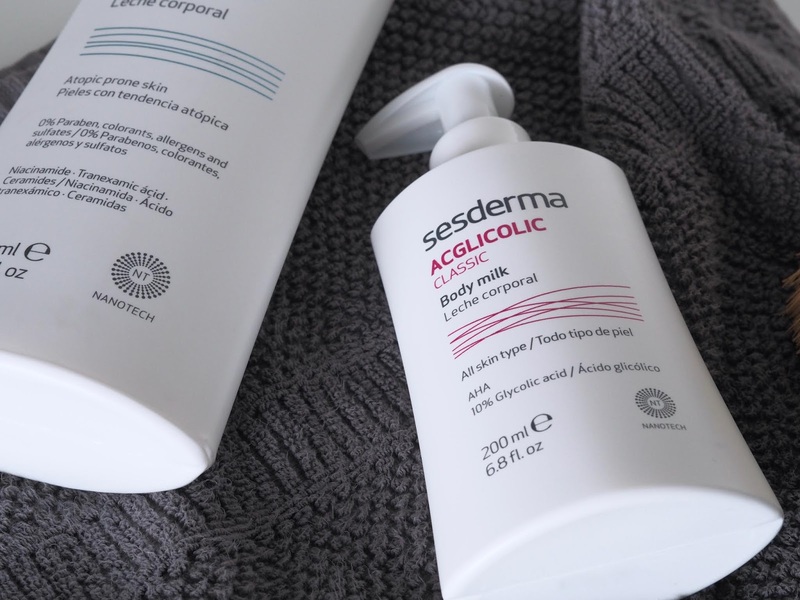 The Acglicolic classic body milk is for all skin types and contains glycolic acid encapsulated in liposomes giving it incredible penetration levels. Glycolic acid is a naturally occurring active that helps to exfoliate the skin and stimulate cell renewal as well as being extremely moisturising. It also contains Boswellic acid which is known to have anti-inflammatory and analgesic properties. I've really enjoyed using these body milks and being a 'milk' they're both really light and melt into the skin, leaving no tacky residue at all. Usually after applying body products I have to wait a little while before I can get dressed but that's not an issue with these, I can dress straight away. The ones I've got at home are quite thick though, a standard body moisturiser, you know, the ones that smell good and hydrate your skin for all of five minutes, but these lightweight ones are better because they are full of active ingredients. And, because of those actives they'll provide more long term results. I do have to be honest though guys and one thing I have to say is that I'm not mad about the smell of the Atopises milk. Don't get me wrong, it's not horrible in any way, I'm just very aware of it when I apply. I'm not sure what ingredient it comes from but it does fade quite a bit when it absorbs in to the skin. I find both of the creams super hydrating but for this reason I prefer the Acglicolic, it's a very subtle scent. Personal taste I guess. You can find all the details over on the Sesderma website and I'm definitely off to browse the anti-aging actives for the face. And, do let me know in the comments that I'm not the only one who forgets their body needs a bit of TLC too! *These products were gifted but all thoughts and opinions are my own.